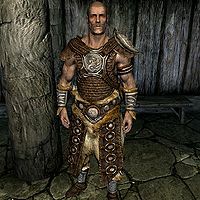 Valdimar is a Nord sorcerer found in Highmoon Hall in Morthal. He becomes your personal housecarl when you have earned the title of Thane in Hjaalmarch. Valdimar wears scaled armor with matching boots and bracers, and he wields a steel mace. He knows the Alteration spells Oakflesh and Stoneflesh, the Destruction spell Ice Spike, and the Restoration spells Close Wounds, Healing, Lesser Ward, and Turn Undead. Although his default gear is governed by the Light Armor skill and he has Light Armor skill perks, his class makes him more proficient in Heavy Armor. Similarly, he's carrying a steel mace while having a perk for axes instead, although you can just switch his weapon, unlike his outfit. This issue has been addressed by version 1.1.0 of the Unofficial Hearthfire Patch; it makes him more proficient in Light Armor. He is the only housecarl whose default armor is not made of steel. When hired as a steward, Valdimar will attempt to travel to Lakeview Manor instead of Windstad Manor as expected due to an incorrect destination marker in his package. If Windstad Manor has not yet been purchased, he will venture off to Helgen instead. Even when not hired as a steward, he may still sometimes appear in Lakeview Manor if you wait or sleep there. This page was last modified on 12 April 2019, at 19:26.